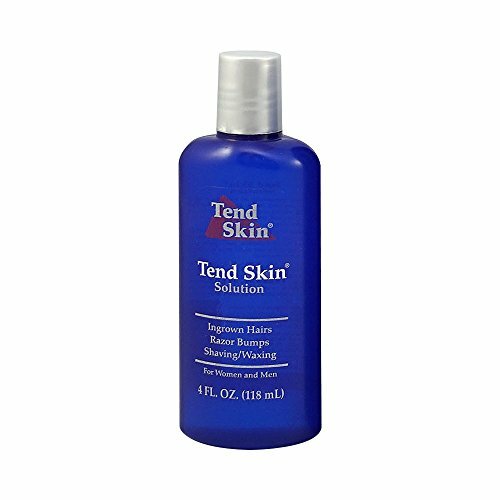 No other product in the world can do all that Tend Skin Liquid does, especially when it comes to ingrown hairs and razor bumps (Pseudofolliculitis barbae, PFB). Razor Bumps (pseudofolliculitis barbae, pronounced \"soo-doe-fol-li-cu-li'-tis): Razor bumps are created when the growing beard hairs exit the skin, curl over, and burrow into the adjacent skin, resulting in an unsightly \"bump\". Razor bumps form on the beard areas of men-mostly Black men and about 15-20% of Caucasian men. Occurrence varies with nationality. Ingrown Hairs Ingrown hairs form when hairs, growing back after shaving, waxing, electrolysis, or other hair removal method, and fail to grow out of the skin. The hairs curl over inside the follicles under the skin (just like the \"razor bump\" hairs curl above the skin). By curling, then creates and unsightly \"bump\". PRE / POST WAXING: Applying Tend Skin Liquid before waxing will "ease" the wax "pull". Tend Skin Liquid Liquid dissolves skin oils that interfere with the wax sticking to hair. It also minimizes hot wax sticking to the skin; which can cause skin tearing during the wax "pull". Wax technicians tell us the hairs feel "loose" during the pull after applying the product. If you have any questions about this product by Tend Skin, contact us by completing and submitting the form below. If you are looking for a specif part number, please include it with your message.